CBS Films' The Woman in Black looks poised to claim the #1 spot at the box office during Super Bowl weekend in what's shaping up to be a close race. Can Daniel Radcliffe open a film outside of the Harry Potter franchise? CBS Films is hoping so. 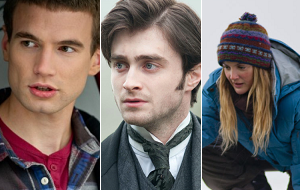 The Woman in Black represents a big test for the young actor. If it fails, he might fall into the same trap that Mark Hamill did after Star Wars. Opening the thriller during Super Bowl weekend certainly limits how well it can perform, but it could hold up well if word-of-mouth indicates that "Harry Potter" can do more than just wave a wand. Healthy activity on Facebook and Twitter indicates that Radcliffe will in fact snag a #1 debut. As of 4 p.m. PT, Fandango reports that The Woman in Black accounts for a respectable of 9% daily sales. The Woman in Black should take in $16.5 million from around 2,700 locations during its debut frame. 20th Century Fox's Chronicle, the latest entry in the found footage genre, probably won't be far behind The Woman in Black. While there's little doubt that the found footage trend will run out of steam eventually, it's in good shape for now. For proof, look no further than the $33.7 million—the number would have been bigger if the buzz wasn't so toxic—debut of The Devil Inside in January. Chronicle received a healthy boost on Facebook and Twitter thanks to the fact that its trailer played in front of The Devil Inside, and it should have no problem snagging a decent percentage of the same audience that showed up for that maligned horror flick. The opening weekend is very crucial for Chronicle—a substantial second weekend drop may be unavoidable because of the flick's genre and the fact that it's aimed at teens. Look for Chronicle to grab $14 million from around 2,800 locations during its debut frame. Big Miracle is the only family-friendly release hitting theaters this weekend. Expectations are modest due to the fact star Drew Barrymore is far from the draw she once was, and co-star John Krasinski is still on his way up. The Warner Bros. release will need great word-of-mouth if it's going to hang around in theaters long enough to make up for what's sure to be a lukewarm debut. Big Miracle is poised to take in $8 million from around 1,700 locations during its opening weekend. Check out our predictions in the table below. Extremely Loud and Incredibly Close Dec 25, 2011 Warner Bros.
It’s in point of fact a great and helpful piece of information. I’m glad that you simply shared this useful info with us. Please keep us informed like this. Thanks for sharing. Visit http://www.juegosfriv2019.org/ and have fun!